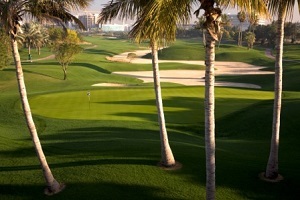 This is the second and concluding part of our look at Dubai Golf and their management of two of the most significant and prestigious golf clubs in the Middle East North Africa (MENA) region – Emirates Golf Club and Dubai Creek Golf & Yacht Club. (Click here to view part one). 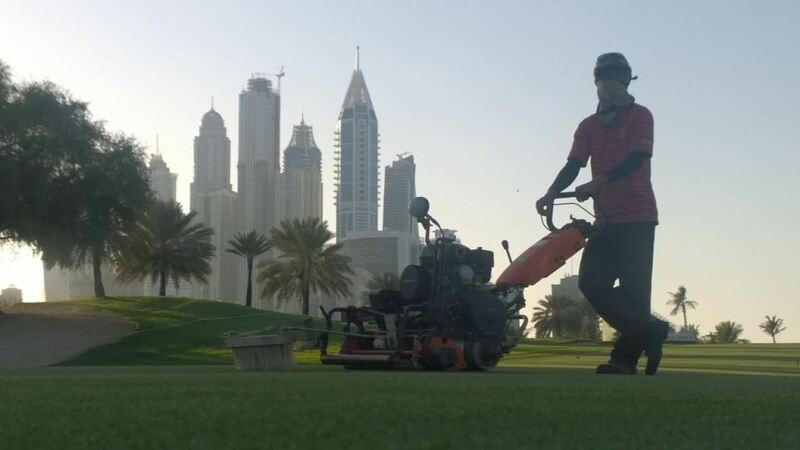 Dubai Golf purchased a fleet of Jacobsen Eclipse2 walking greens mowers towards the end of 2014 and used them on The Faldo Course, which has Paspalum greens. “Prior to making the decision to change we ran a series of tests to ensure that these new units would perform as we wanted,” said Craig Haldane. 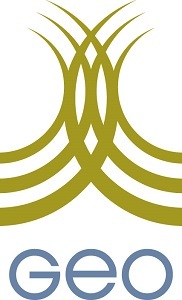 “It took us some time to learn just what they were capable of, but we found the quality of cut to be fantastic. What is really impressive is the tightness we are able to get in the sward due to the ability to play with clipping yields. “At the standard set up we were collecting 40% more clippings than in the past and that alone was reason enough to move forward. When you really begin to fine tune the units, particularly on Paspalum surfaces, we quickly realised that we had an additional tool to assist us with improving ball roll significantly. With this course being a floodlit facility we entertain night golf and to maintain more consistency throughout the entire day was a big plus. In the past we may have had to come out mid-afternoon and cut the greens again, but this is now a very rare occurrence. The Golf Environment Organisation (GEO) is the sustainability group founded to support the golf industry, helping it deliver and be recognised for a positive impact for the people and nature it touches, now and in the future. GEO is dedicated to helping the golf sector come together around sustainability, building a reputation which demonstrates that the game is committed to contribute to the sustainability agenda. The industry reaches millions of people so has the opportunity to be a catalyst by raising sustainability awareness and leading by example. “We were introduced to Jonathan Smith from GEO in 2010-11 and loved the concept and ideology behind GEO. In fact, it became one of our Key Performance Indicators and my task was to get us to a stage where we would be ready to move forward with the certification. We created a team internally and began to meet on a regular basis, slowly going through the system and implementing as much of what was required as possible. In 2014 I felt confident that we were ready for a visit, at which point we invited Pablo Munoz over to Emirates to visit us for four full days to go through our facilities not only in Golf Course Maintenance, but also our clubhouse, kitchens, engineering and all back of house areas. “It was an intensive few days but, with the experience that Pablo brought with him, we were made to feel relaxed and the aim was always to help us highlight what in fact we were already doing very well and for us to have a means to start shouting about it for all the right reasons. We quickly realised that we were already doing a lot of the best practices, particularly within the course maintenance department. As an industry, most Golf Course Superintendents are fantastic stewards of the environment and will be doing the right thing anyway. “GEO gave us some great suggestions to enhance what we are doing, as well as suggestions on areas where we may want to look at and introducing new elements to what we already do. This year, the Dubai Creek Golf Club will be certified meaning we will have both properties fully certified, something we are very proud of. Marinus Koekemoer is Desert Turfcare’s Fleet Manager for the Dubai Golf contract. They are maintaining a fleet in excess of 600 machines for the two courses with a team of 25 mechanics and a dedicated administrator based at each course. He work’s very closely with Craig Haldane. Like Haldane, Koekemoer is a South African who began his career as an apprentice turf technician in 2003 with Golf Matrix, a local Golf and Turf dealership. During his five-year period with the business, he was involved in service and fleet maintenance contracts throughout the country, overseeing fleets of John Deere equipment. After winning the Sun International contract, he moved to Limpopo to run the fleets at the Gary Player and Lost City, his first major tournaments being The Nedbank Golf Challenge, the Woman’s World Cup and Dimension Data Pro-Am Championship. In 2007 he relocated to the Western Coast of South Africa, working as Equipment Manager for Turfworx before being promoted to National Technical Manager, where he was responsible for overseeing the equipment fleets at Pezula championship golf course, Pinnacle Point and several other sports fields. 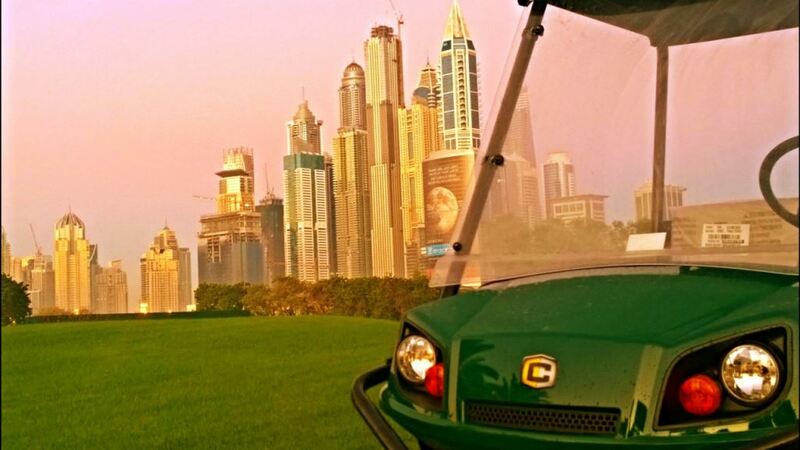 Then in 2014 he was offered the job at Desert Turfcare as Fleet Manager for the Dubai Golf contract to maintain the fleet of equipment at Emirates and Dubai Creek. 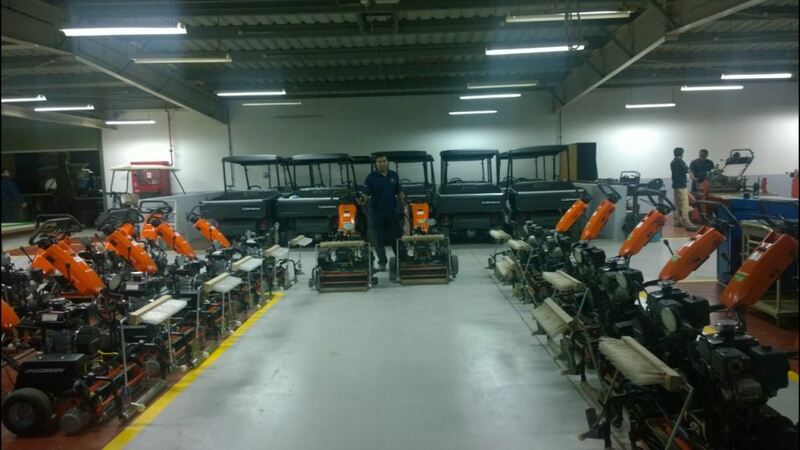 The combined fleet consists of around 300 items of mowing equipment and almost 500 golf cars. Included in the maintenance contract is a five year equipment replacement program with Ransomes Jacobsen and upgrading of the workshop facilities. “As you can imagine to maintain a fleet of this size requires a lot of people,” he said. 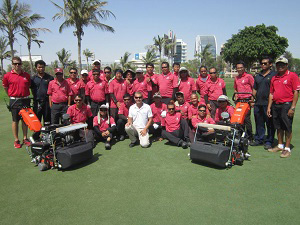 “We have a dedicated team of 23, working in different shifts to cover all areas of Dubai Golf’s operations. This includes technicians, administrators and cleaning colleagues with the main focus on preventative maintenance to ensure that the Jacobsen equipment is performing to its optimum and that the customer (Dubai Golf) receives the best service possible. “New upgraded service schedules have been put in place to ensure any issue is detected long before it becomes a major problem. Together with Ransomes Jacobsen we are working on a new intensified training program with all the data we collect from our operations. The two golf clubs host some of the most prestigious tournaments in the Gulf: Emirates Golf Club hosts the Omega Dubai Ladies Masters and Omega Dubai Desert Classic while Dubai Creek Golf & Yacht Club play host to the Mena Golf Tournament, Dubai Creek Open and most recently the Icons Cup, featuring two teams of iconic sports stars from the USA and Rest of the World. “At Emirates preparation for the course starts in November when we overseed the Majlis with rye grass,” Koekemoer continued. Dubai Golf has a number of tournament support vehicles, which are used by contractors and European Tour during the set-up for the tournaments. Two months prior to the Ladies Masters these vehicles are prepared and allocated to individuals in different departments. Golf in Dubai, the events management company, Dubai Golf and the European Tour sends a list of vehicles required for the duration of the tournament to Marinus. To keep track of every golf car and utility vehicle, they are labelled and a spreadsheet created to monitor who uses them each day. Individuals have to sign the vehicle in and out. Once a golf cart gets signed in after use, it is checked and charged to be used the following day. “Before each tournament my technicians check equipment oil, coolant and lights and then all the equipment to be used on that particular day is lined up for the operators. We then have a morning briefing with the entire team to confirm the operation of the morning cut. 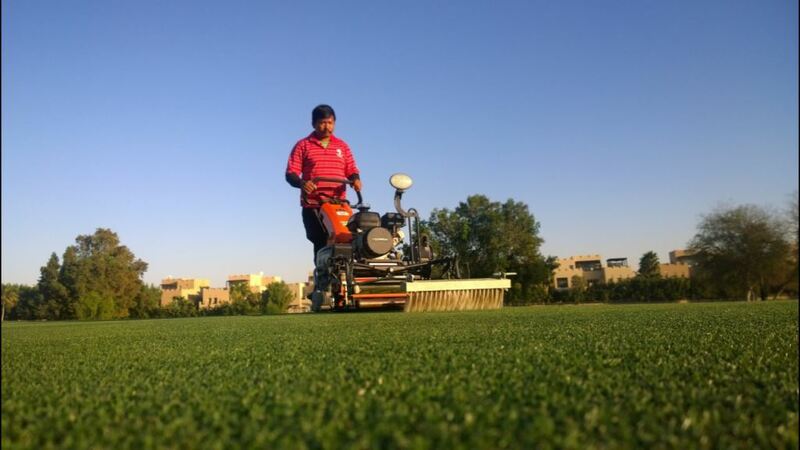 “The mowers are driven out to their respective areas and are checked on the course; we have one dedicated technician for greens mowers and a team of 2 technicians checking the other equipment. The remainder of the team stand ready in the workshop for call outs on any issues being detected. “The tournament support vehicles are checked again to insure they are fully charged, signed out and parked at their designated areas. After mowing, all machines return to the maintenance facility where they are washed down, sharpened, refuelled and checked again for the evening cut. Any issues reported or noted need to be attended to in this time period. “As for the morning cut, an evening briefing takes place with the team, and the same mowing routine is followed. Once the equipment has returned it is prepared for the next morning cut. All the tournament support vehicles are signed in, checked and charged for the next morning’s operations. “With the Eclipse 2 we are able to mow at a higher height of cut by setting the frequency of cut (FOC) according to the height setting of the mower or adjusting the mow speed slower with a higher reel speed to increase the FOC to get more cuts per metre. This means healthier turf, less stress on the greens and less mowing. “The Eclipse mower has really come a long way from where it started and having worked with all three major brands, I can confidently say that it’s right on top when it comes to quality of cut and ease of maintenance. Being able to set the FOC and weight distribution of the machine ensures that the Eclipse 2 can be used for any type of turf and conditions. “The TrueSet cutting unit adjustment, which allows the reel to blade and height of cut setting to be made with exceptional precision and using only one tool, is a great feature.